TV for Hotels - A New System by Dec 31st? TV for Hotels – A New System by Dec 31st? TV for Hotels – A New System by December 31, 2017? installed for your property by the end of the year. Its All About Satellites has been installing hotel television systems since 1996. With installations in 27 states and counting, a technical staff of 100% fully certified installers, and an owner who is on the DIRECTV Dealer Advisory Board for Lodging and Institutions, we are the experts you have been looking for to get your new TV system installed by the end of the year. Whether you need a headend system like the DIRECTV COM2000 or an L-band system like the revolutionary DIRECTV REsidential Experience, we have experience installing them in hotels large and small. Whether your hotel is a new build, a property you purchased in receivership, or you are going through a change in hotel brand or brand standards, we make changing your TV provider and getting your new hotel TV system seamless and easy. If you install a new TV system for your hotel or renew your agreement with DIRECTV prior to 12/31/17, you may be eligible to receive 48 channel COM2000 or DIRECTV Residential Experience (DRE) HD equipment at NO EXTRA COST* when you sign up for a 5 year agreement! That is up to an $11,000 value for the COM2000! We can provide your hotel with 100% financing on both the equipment and the installation through Ascentium Capital with a 24 hour turnaround. This way you have low, low upfront costs to install a new high definition hotel television system. *COM2000 OR DRE EQUIPMENT OFFER: Offer is available to new or renewing Hospitality and Institutions customers who activate within eligible dates (8/1/17 to 12/31/17). 5-year programming agreement required. Properties must subscribe to SELECT Package ($5.50/room/mo) or above, with local channels ($0.50/room/mo. ), if available in your market, HD Access ($0.75)/room/mo.) (requires HD in all units), qualifying premium channel service; requires 75-room minimum for COM2000 equipment; 50-room minimum for DRE equipment. A (DRE) System software receiver fee ($0.40/room/mo.) applies for DRE equipment. Add’l equipment and fees apply for upgrades. Installation charges apply, installation fee is based on hotel size. Applicable use tax adjustment may apply on retail value of installation. 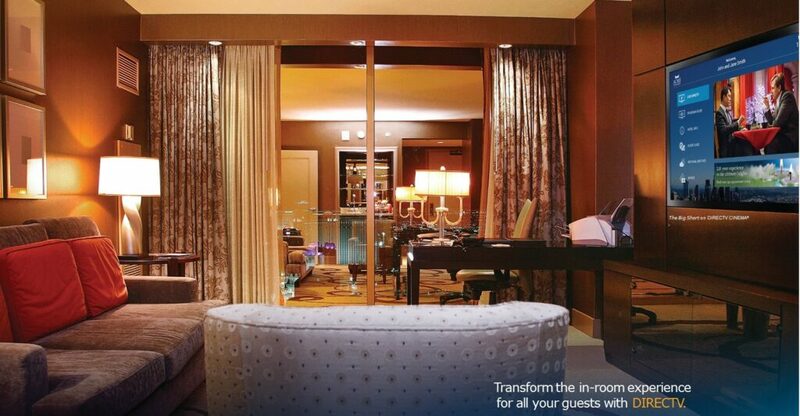 Value for DIRECTV Residential Experience equipment is based on a 100-room property.